Can you talk about your process for The Earth? 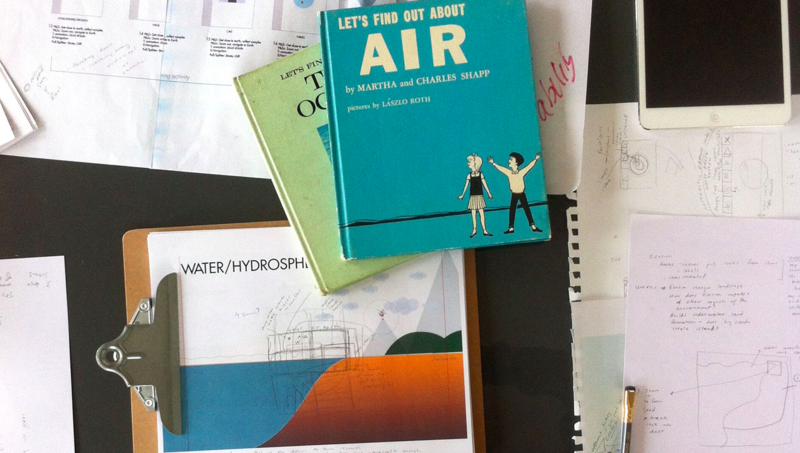 As you may know I’m an illustrator, but I also work as a production designer here at Tinybop. I had the unique experience of seeing this project from the very beginning. That means I got to help figure out how the app itself would work in addition to drawing the images for it. As a team, we started with a lot of research. I read the Smithsonian’s Earth: The Definitive Visual Guide from cover to cover many times. Then we thought about how to present and structure it all. Brainstorms were all over the place. One early idea was to have a little rock be your avatar. You’d roll it around to discover new places and systems. Things like that. We ultimately landed on having a large, panning app so you could explore a larger landscape. This would give a greater context to the very specific, focused interactions that exist in the close ups. How did you choose the close ups? From all of the places and layers of our planet we could choose, we landed on a diverse cross-section of interactions that were visually and conceptually interesting for kids. 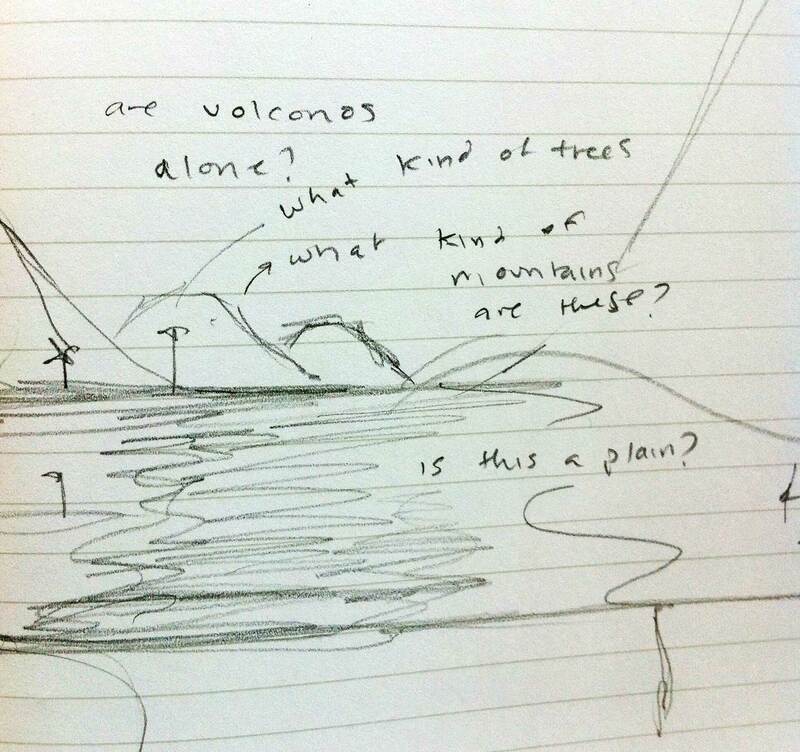 There were some very obvious things: volcanoes! Earthquakes! And some not so obvious things that we felt were important to teach, but a little more visually challenging: like, erosion. We tried to find things that were big and small, hot and cold, wet and dry. What were your inspirations for The Earth? 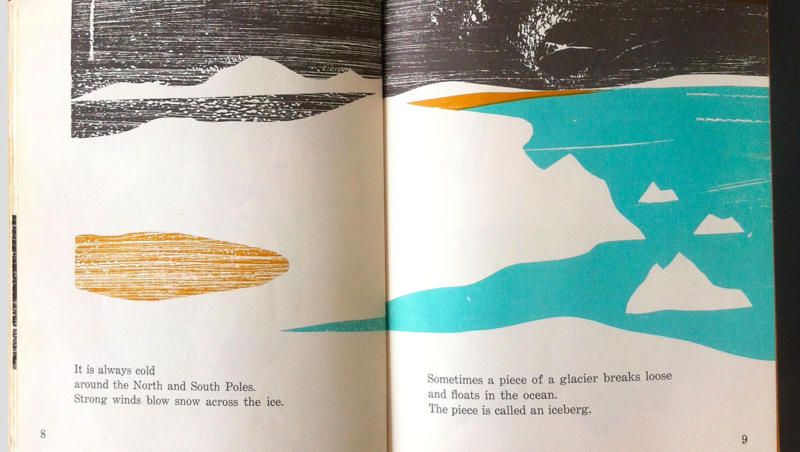 In terms of visual inspiration, I spent a lot of time looking at science and geology books like Smithsonian’s Earth, but also tried to find older books that simplified the topics, like children’s books from the 60s and 70s. Planet Earth, a De Luxe Golden Book by Gerald Ames and Rose Wyler, was a strong influence. Cornelius DeWitt illustrated it in 1963. I believe Kelli Anderson looked at DeWitt’s work as well while working on the Human Body app. DeWitt’s a real genius at breaking down information into beautiful little visual narratives. Little Golden Books in general are great at this. I love children’s books. I think stories are catalysts for learning, so I tried to look at fiction books that feature land as characters. One of my favorites is Cecil the Pet Glacier by Matthea Harvey, illustrated by Giselle Potter. 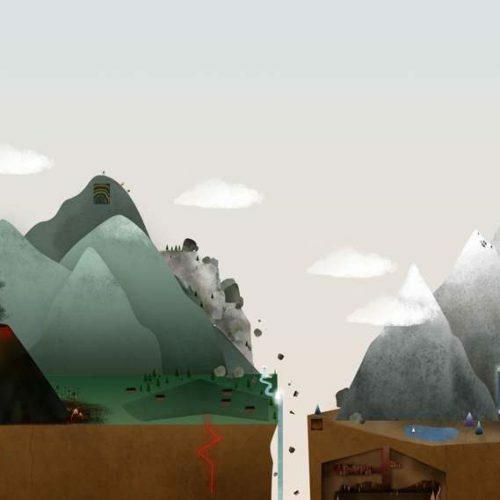 Stories like these aren’t necessarily helpful for accurate information about Earth processes, but they are inspiring when it comes to thinking about how to represent the information as little stories for younger learners. I live in Crown Heights, a very neighborhood-y section of Brooklyn, that’s quite close to Prospect Park, which played a huge role in The Earth, actually. I found that I really needed to see land while drawing this app to look at the actual colors in dirt. I’d go there on the weekends just to see and touch it. I also worked on a children’s book at the same time I was making The Earth. The book focuses on seasons and the woods, so it was a perfect pairing. 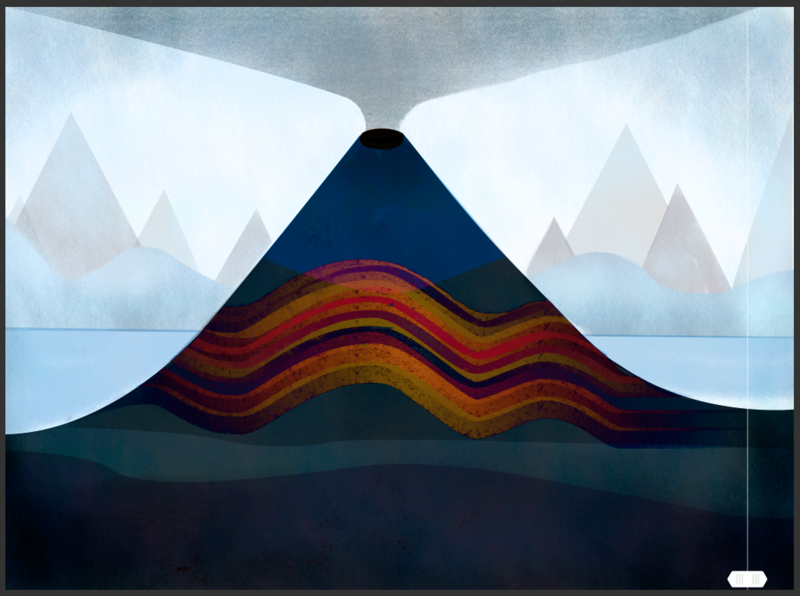 I spent the summer painting mountains and trees for the book, then taking those paintings and making digital drawings of mountains and trees for the app. The two projects really synced up quite well. I’m excited for the book to come out so that I can compare the two projects in real life. But sadly, that won’t be until fall of 2016 because books take a long time to publish. In the meantime, I’m working on a couple more books of my own and a short series of paintings for gallery shows. I look for inspiration in specific places. Where I look for inspiration depends on what kind of inspiration I’m looking for. If I’m looking for general story ideas or drawing ideas I go for walks. I look for human beings being themselves. If I’m looking for drawing or process inspiration I usually turn to children’s books. If I’m looking for very specific solutions to visual problems, I’ll try and look at other illustrators who I know and love. I really like David Plunkert’s visual solutions. Carson Ellis and Laura Carlin are two of my favorite children’s book artists. 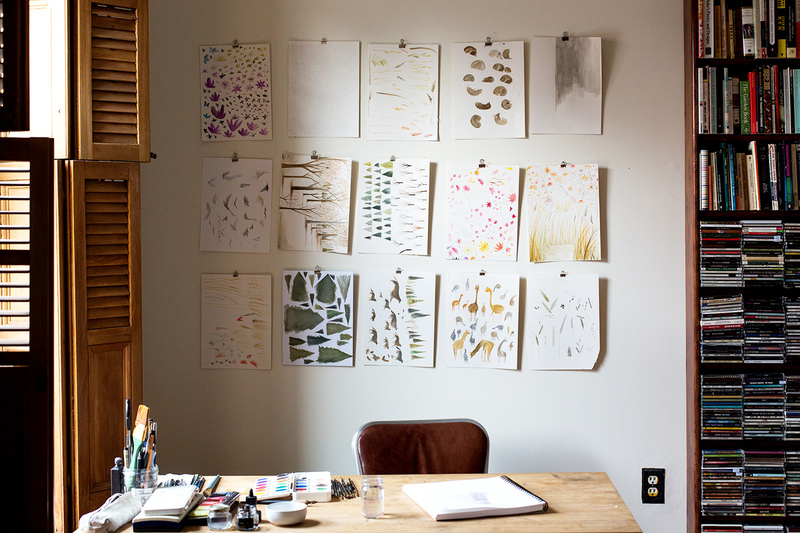 Esther Pearl Watson’s and Keith Negley’s textures and colors are sumptuous. I could stare at Lilli Carre’s animations for hours. I tend towards the expressive, the weird, and the folkish. I was that way when I was a kid as well. Very into fantasy, creatures, Narnia, The Dark Crystal, and any media that operates in its own universe. That said, I really like when fantasy meets reality—when a mundane moment gets turned on its head. I read a lot of books. A whole lot. I spent a lot of time in libraries. I grew up just outside of Philadelphia and I happened to have access to four local libraries. The resources and time I had! I probably spent more time reading than drawing when I was young, though I certainly recall drawing and painting a lot. I didn’t really get into pursuing illustration professionally until after college. For me the story is the greater thing and beautiful drawing or painting surrounds, or illustrates, the story. The story can be big or small, a tome or a phrase. I still read and collect children’s books; my favorites are always a combination of classics and new books. At the moment my bedside table has piled: both Roxaboxen and Miss Rumphius by Barbara Cooney, The Iron Giant (the Ted Hughes and Laura Carlin version), Pool by Jihyeon Lee, Greg Pizzoli’s Watermelon Seed, Dizzy by Jonah Winter, Jane, the Fox and Me by Isabelle Arsenault. I love children’s books because they help me continue to be curious. I think having a healthy sense of curiosity and wonder helps humans beings, both big and small, exist and grow in the world. Tinybop’s apps contribute to this sensibility, and I’m very happy and proud to help the cause. Thank you, Tinybop!